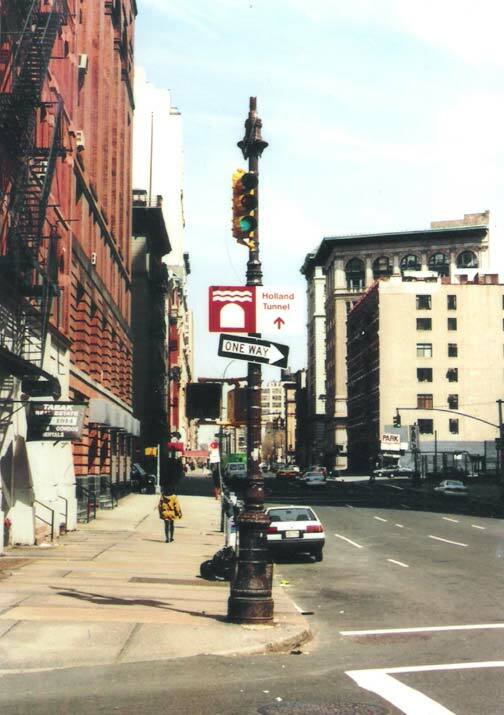 I first encountered a very odd Bishops Crook post in 1998, during the first flush of ForgottenMania, at the NW corner of Hudson and Duane Streets, opposite Duane Park. From the base to the top of the shaft it resembled most other regulation Bishop Crook posts, with the ornamented candy cane or bishop’s staff curving down to hold the luminaire. This one, though, was distinctly odd, with a simple pipe holding an L-shaped fixture which bore a 1980s sodium bucket light. It had suffered a miserable misfortune. But what? 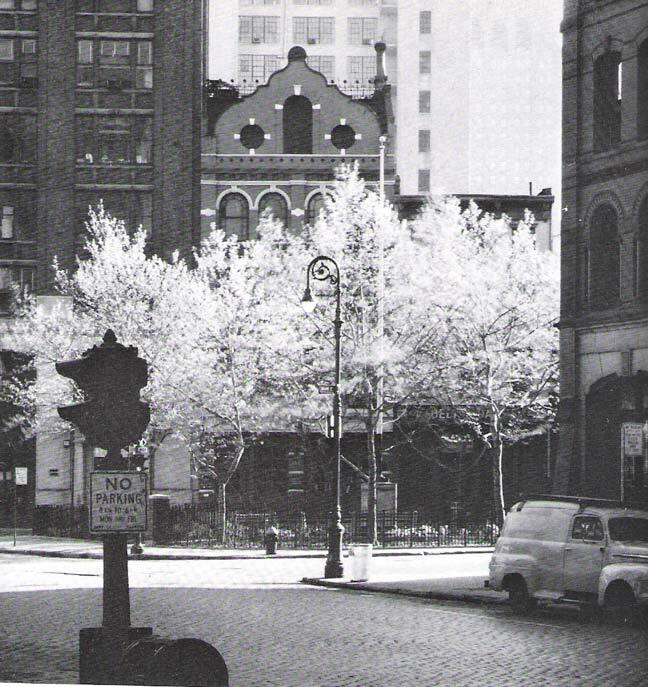 In this photo we see this Crook in its near-original form, with Duane Park behind it. In (the early 1960s? 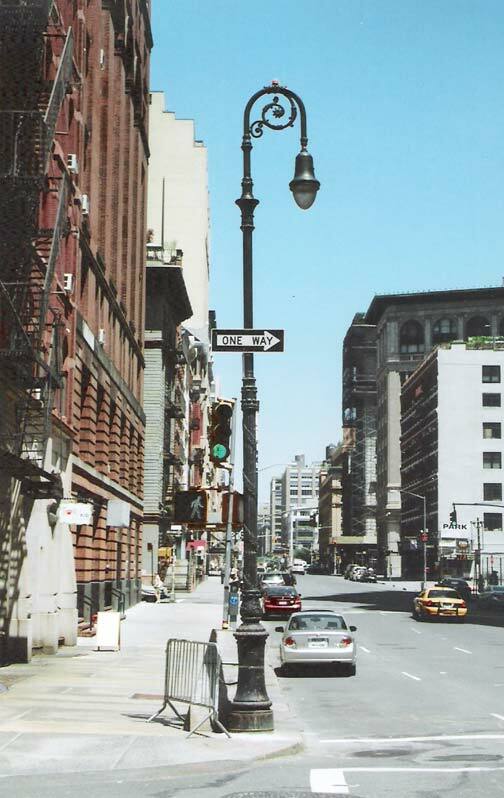 ), many Tribeca streets still wore Belgian blocks, and there will still catercornered olive-colored Ruleta stoplights. 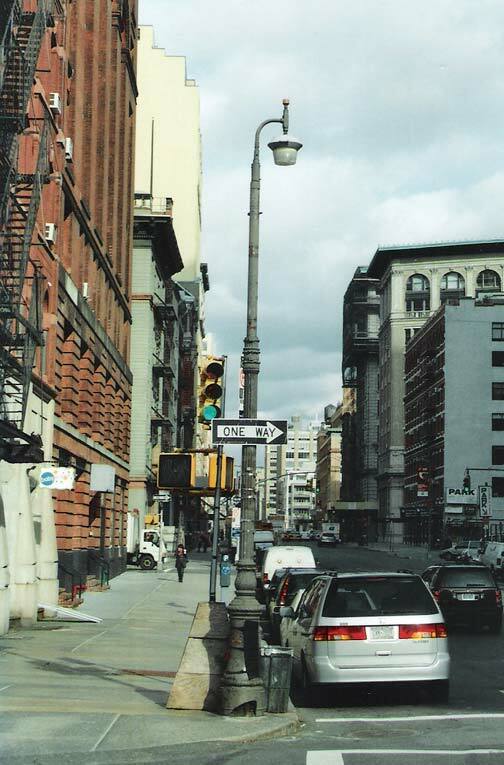 By 1978 Hudson Street had been macadam’ed, and additional signs and a stoplight had accreted onto the Crook. By 1986 the Westinghouse cuplight had been replaced by a brighter sodium bucket light. 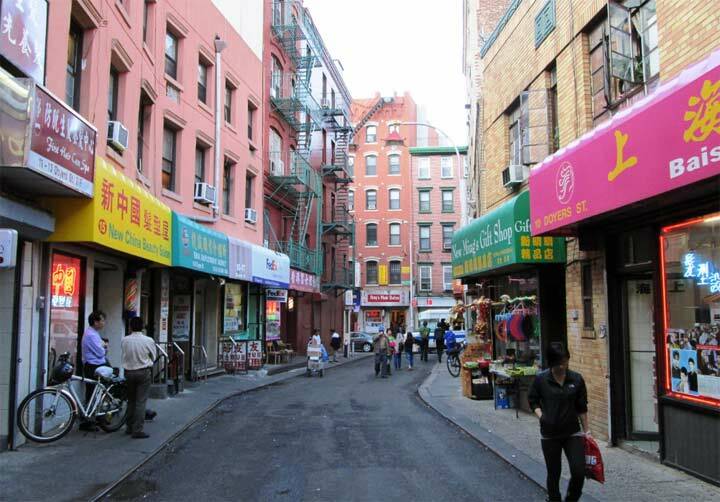 The Manhattan color-coded gold and black street signs had been replaced by federally-mandated green and white signs. By 1996 a calamity had clearly struck and the entire crook section had fallen off. What could have caused this? My guess is an extremely strong gust of wind had knocked it off, if rust had been able to compromise its integrity; or perhaps a truck had struck a glancing blow and sheared it off. 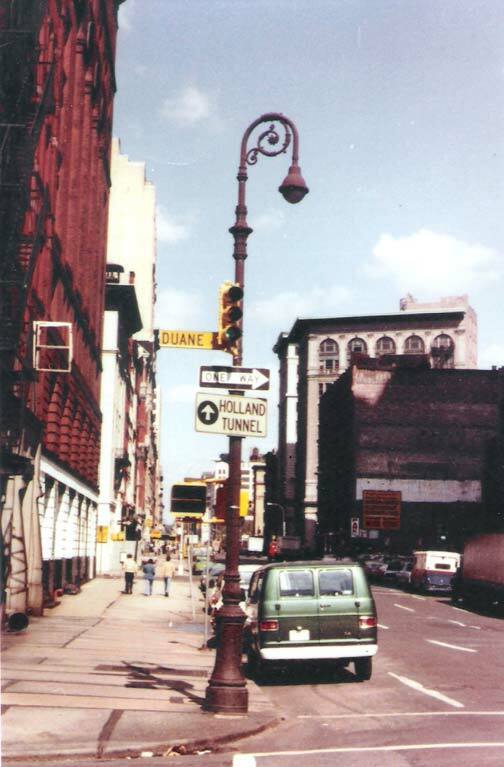 Note the new pictographic Holland Tunnel sign. 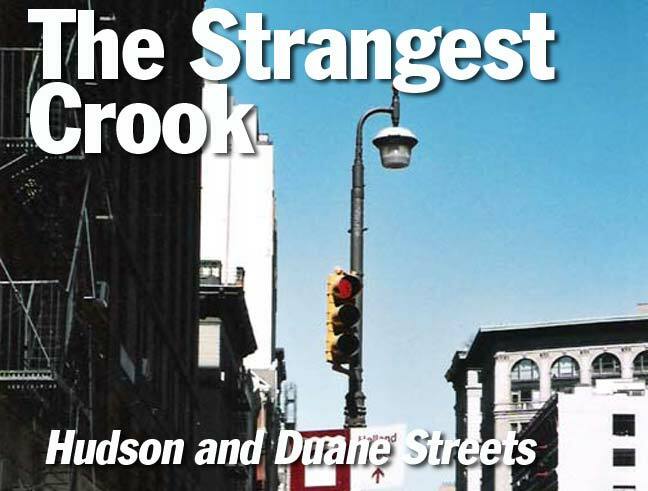 Later in 1996, the Crook had attained the iconically odd state it was in when I first found it. 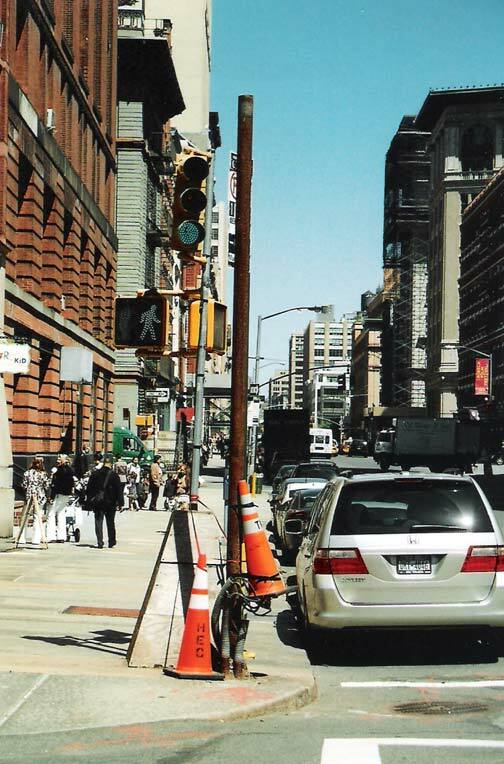 Apparently the Department of Transportation was fresh out of Bishop Crook masts and quickly improvised, placing the bucket light on an L-shaped pipe. Changes were afoot by 2010. 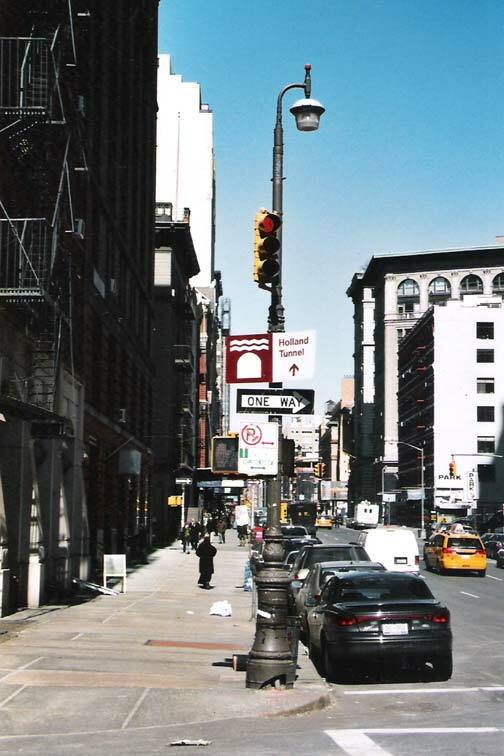 The stoplight and pedestrian control had been re-mounted on a temporary post, and most signage had been stripped off the Crook. Soon there was nothing left but the interior pipe that carried the wiring. Finally, the weirdest Crook was replaced by a more regulation model retro-Crook. The book is closed. Photos from the Bob Mulero collection. I think the top photo was taken way before 1963. Note old-style parking signs. The vehicle in the picture is a 1953-55 Ford panel van. Since it isn’t too beat up yet, one would presume that the picture dates from the late Fifties. Just today I was thinking about those old-fashioned square no parking signs! Is the book closed? The traffic light still looks to be mounted to a temporary base, which in turn is strapped to the new crook. The glass bowl seems to be a bit deeper than usual–which I like! I’d think they have a real stoplight there by now. I took a trip to the locale in the Googlemobile. 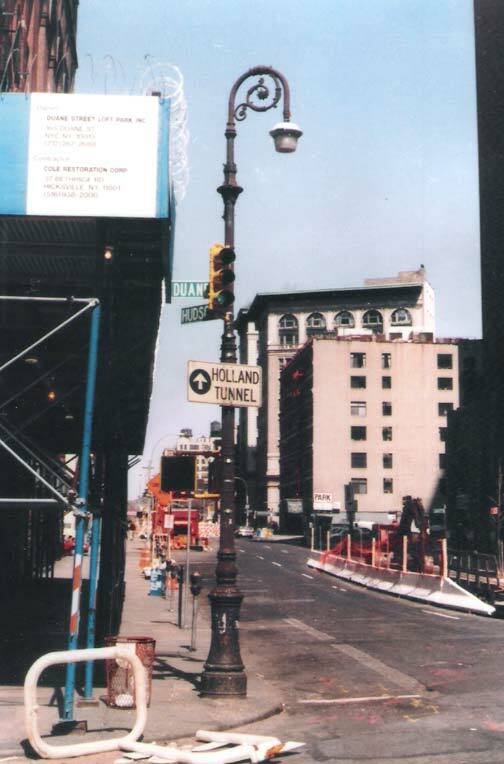 The traffic light and pedestrian signals have been mounted to the crook’s pole. I wonder if the new pole seen in the final photo was indeed the old pole, repaired at the shop and returned to the corner ? Wonderful photo sequence! Time-lapse-style comparisons are excellent. I am the person who saved the curled up part of the crook after a car hit the post. It was stored in our basement for years as we harassed DOT to restore.